The Electrical Industries Charity has announced that their team of 18 trekkers are back from their biggest challenge of the year, the Challenge for a Cause – Arctic Adventure 2018. 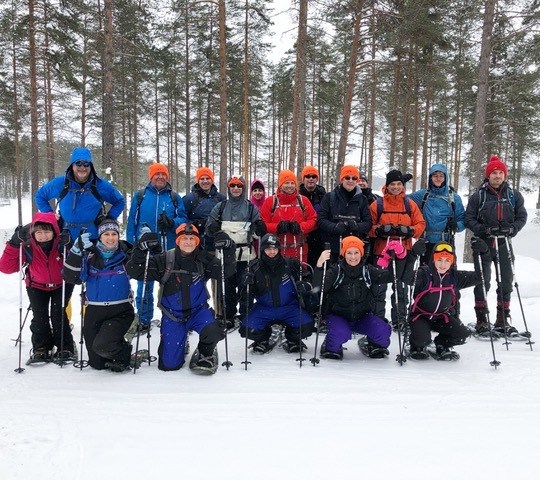 In March, a team of 18 industry trekkers joined Tessa Ogle, managing director of the Electrical Industries Charity, and embarked on the three-day journey through the Arctic Circle of Kuusamo, Finland. They included Caz Dickinson’s daughters Jodie Dickinson, Rachel Wright and Rebecca Dickinson, together with Andrew Reakes, Geoff Kerly, Darren Wetherill, Dave Gilbert, Paul Reeve, Cathy Plummer, Alan Plummer, Michael Burnard, Charlie Harwood, Paul Rhodes, and Keith Sampson. Team Stearn Electric, which included Mark Booth, Kate Menzies, Scott Champion and Sean Miller, also joined the challenge. Throughout the three days in the Arctic, the Challenge for a Cause team faced sub-zero temperatures and experienced various challenges including building their own igloos to sleep in, six hours snowshoeing, cross-country-skiing, husky sledding and the ice dip challenge in -9˚C temperatures. The team undertook the Challenge for a Cause to the Arctic to raise money for the Dickinson family which will help Caz with her development and care and will create a better future for the whole family. So far, the team has raised £125,716 and is halfway towards the initial target of £250,000. It is not too late to show your support for this incredible cause and help the Dickinson family to look forward to the future.